You may know the woman behind the wig in KFC's newest pick for the character of Colonel Sanders. 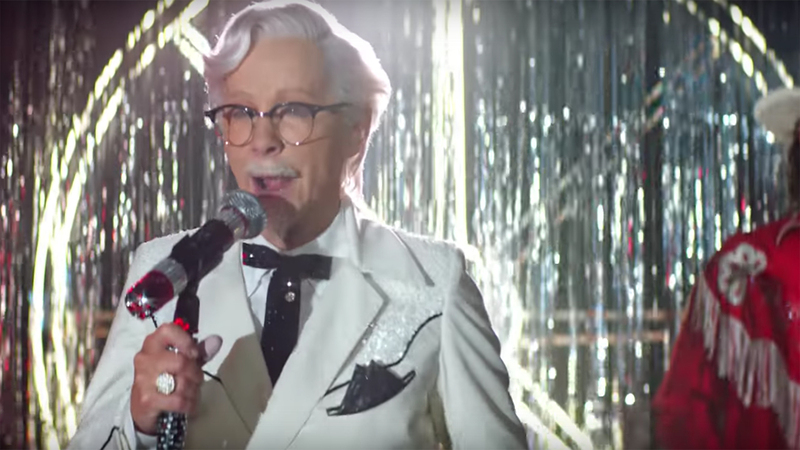 Grammy-winning country music star Reba McEntire dons the iconic white suit, black string tie, glasses, white wig and, yes, goatee as part of ad campaign for the fast-food chain's new Smoky Mountain BBQ fried chicken. The new flavor will be available at participating KFC locations on Jan. 29. McEntire is the 11th person to play the chain's famous founder, Col. Harlan Sanders.Previous portrayers include actors Ray Liotta, Rob Lowe, Norm McDonald and Darrell Hammond. She debuts as the Colonel in a 60-second TV ad set in a honky tonk, performing an original ode to the Colonel and the new chicken variety that was written by the brand's creative team. (The "real" Reba also makes a cameo, in the audience.) A 30-second version will air during CBS's broadcast of the Grammy Awards on Sunday night. "With Reba's southern roots and entrepreneurial spirit, she truly embodies the values of the Colonel and the crowd-pleasing flavor of our Smoky Mountain BBQ," said Andrea Zahumensky, CMO, KFC U.S., in a statement.